Latex-ite® Ice and Snow Melt is a 5 star rated, high performance ice and snow melt blend that is safer for kids, pets, and shrubs and acts quickly at lower temperatures. It is packaged in a pail for easy access and storage. 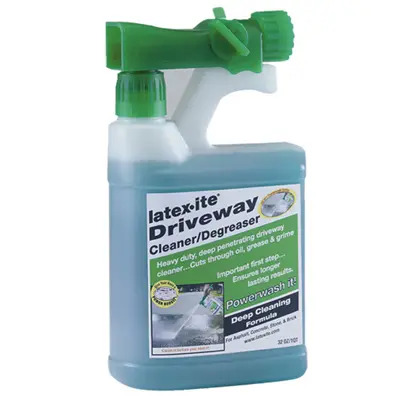 Latex-ite Ice and Snow melt’s crystal flakes work quicker as it contains a fast-acting De-Icer agent. No powdery residue so you don’t have to worry about tracking. Organic tint added which gives you better coverage. If you have a large area you can use a Scott’s fertilizer spreader to apply: a setting of between 10-12 on the Scotts Dial should work. Remember, Latex-ite Ice and Snow Melt should not be used on old or structurally poor concrete. It should not be used on concrete that is less than 1 year old. Keep treated slush away from plants and vegetation as best as possible. Keep product in a dry place when not in use. From the Leader in Driveway Maintenance since 1945. 5 stars: "We have a steep driveway and must keep it free of ice or it becomes treacherous for cars and people. This product works great. I prefer a plastic pail and 30lbs is easy to carry and dispense from." 5 stars: "I've used this product for three winters now because it is superior to the 'regular' white granular ice/snow melt. It works faster, is much more efficient, you don't need as much to do a more thorough job! I will never go back to the 'usual' snow/ice melt again unless there is nothing else available. And if you have a problem, the manufacturer's customer service is great. He does stand behind his product...."